Test your stamina and learn you what you're capable of, along with thousands of artists of all skill levels from around the globe. Albuquerque has consistently been one of the largest gatherings in the world for this international event. See photos from past years here and here. This year, we return to Media Arts Collaborative Charter School (MACCS) in Albuquerque, at 4401 Central Ave. N.E. If you plan on participating, please send an email so we can get a count of participants. This event is open to all ages (with guardian's permission for minors). 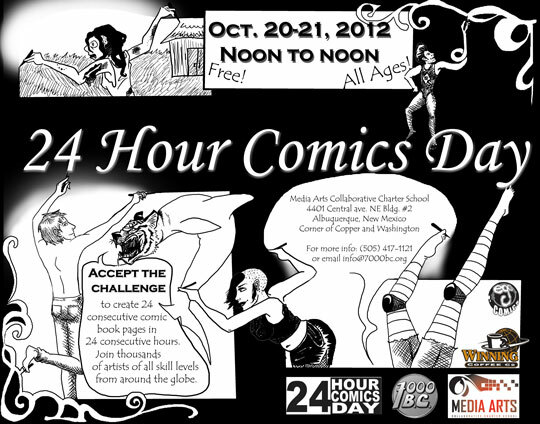 Bring your papers and pens and join us at New Mexico's only 24 Hour Comics Day location in 2012! Update: the annual blog following the hour-by-hour adventure is at 24 Hours from Q-Town 2012. Update 2: and Aliina's got her own blog from her remote location.